Who would have thought…using Pepsi bottles to grow vegetables? Initially, the notion of “Pepsi” and “vegetables” in the same sentence might seem a bit far fetched. 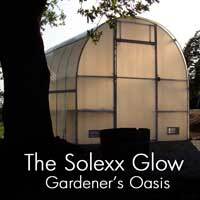 Yet with some creative and resourceful thought, Solexx Dealer Greg Hancock, of Remote Gardener has proven this possible with effective results. Through the Pepsi Refresh Challenge, Greg has demonstrated his passion for recycling and hydroponic growing. The Pepsi bottles serve as reservoirs for his hydroponic system, while the attached piping circulates water from the main pump, guiding nutrients to feed the plants. As we speak, Remote Gardener’s customers are enjoying the zesty flavors of fresh tomatoes, peppers, and herbs from this season’s harvest. When speaking with Greg about this project, he made a valuable point. Not only is recycling a main focus, but also being preventative in keeping bottles out of landfills, utilizing them for another purpose (ahem, for those of us who keep forgetting to recycle—a great reminder of what we can accomplish!) Pepsi Refresh then provided the challenge for an important cause, and Whallah—A new purpose and goal to change the world! In this case, one Pepsi bottle at a time. Remote Gardener’s long term goals for this project—To educate individuals with creative ways to grow healthy food by offering gardening education to their community. Greg also plans to replicate this system and offer it to his customers. Pepsi drinkers—get ready! Remote Gardener is gaining rank in the Pepsi Refresh Challenge, jumping from the top 25 spot to the top 20 spot last week! To show your support, you can click here http://www.refresheverything.com/remotegardener to vote up to 3 times per day, or vote through your Facebook account, Pepsi account, or by texting 106879 to Pepsi (73774) from your mobile phone. Power Votes found on the specially marked Pepsi caps, and boxes serve as 100 votes each! Good luck Remote Gardener—from all of us at Solexx! Very innovative idea to grow plants. Great work! The can are so well utilized and the hydroponic technology makes gardening easier.